WASHINGTON, DC, December 14, 2015 (ENS) – The world has warmly received the breakthrough Paris Climate Agreement reached Saturday in Paris that for the first time, unites wealthy nations and poorer ones to take common climate action. Politicians and civil society leaders from around the world expressed optimism and hope that humanity has acted in time to curb runaway climate change. “In 2009, we helped salvage a chaotic Copenhagen Summit and established the principle that all countries had a role to play in combating climate change. We then led by example, with historic investments in growing industries like wind and solar, creating a new and steady stream of middle-class jobs,” said Obama. “We’ve set the first-ever nationwide standards to limit the amount of carbon pollution power plants can dump into the air our children breathe,” Obama said of his Clean Power Plan, which is being challenged in court. “Now, skeptics said these actions would kill jobs. Instead, we’ve seen the longest streak of private-sector job creation in our history. We’ve driven our economic output to all-time highs while driving our carbon pollution down to its lowest level in nearly two decades. Obama credits the joint announcement with China last year that both countries would work together to lower their greenhouse gas emissions within the next 15 years as inspiring the success of the Paris climate conference. Chinese President Xi Jinping and Obama said Monday they are ready to work together to make sure that the climate accord reached in Paris will be effectively implemented. In a telephone conversation, Xi noted that the Paris deal charts a clear course for global cooperation on fighting climate change from 2020. “China is willing to work with the United States and other relevant parties to ensure the implementation of the Paris deal, and effectively expand pragmatic bilateral cooperation in tackling climate change so as to bring more benefits to the two peoples as well as people in other parts of the world,” Xi told the Chinese state news agency Xinhua. China wishes to maintain coordination and cooperation with the U.S. side on major global issues, he said. The Paris Climate Agreement is built on the Intended Nationally Determined Contributions (INDCs) submitted by 187 countries in advance of COP21, the 21st Conference of the Parties to the UN Framework Convention on Cliamte Change, UNFCCC. The remaining countries are encouraged to issue their INDCs promptly. But the proposals made to date will, at best, take the world about halfway to the target of 2 degrees Celsius or 3.6 degrees Fahrenheit, above pre-industrial temperatures. Scientists agree that we must hold total warming below 2 degrees to avoid dangerous climate change. Yet even at that level, island and coastal communities would be at risk of flooding by rising seas. World leaders agreed on the 2 degree goal at the UN climate conference in 2009, confirmed it in 2010, and enshrined in the Paris Climate Agreement on December 12. While commitments made under the Paris Agreement don’t meet the target goal, most stakeholders view the document as an effective instrument that will at least begin to limit the greenhouse gases responsible for planetary warming. The Parties included language that requires them to work toward holding the increase to 1.5 degrees C, or 2.7 degrees F.
To date, average global temperatures have risen by about one degree Celsius, or 1.8 degrees F higher than 150 years ago. Most of the warming has happened in the past 50 years. 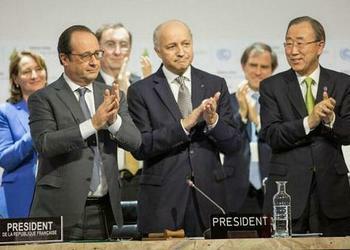 Keeping total warming 1.5 degrees is crucially important, countries agreed in Paris. To approach the lower 1.5 degree target, the agreement calls on nations to assess their progress every two years. They agreed to come back together five years from now to build on those gains by setting even lower goals going forward. The financial community has expressed its support. The business community is also supportive.